The Enagic SD501 performs "as advertised" however this model lacks the features, advanced technology and longer warranty period associated with many other water ionizers in this price range. There was a lot of hype about Enagic's SD501 Kangen Water Machine so we were excited about checking this one out. At $3,980 it is one of the most expensive water ionizers on the market today - more expensive than some 9-plate water ionizers. With only 7-plates and 230 watts of power we wanted to know just how the company is able to command such a high price for this machine. In all honesty, we were disappointed in this one. We were looking for something "exceptional" that might account for the price. 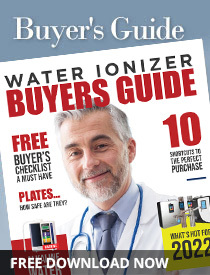 What we found was a basic 7-plate water ionizer that performed well, but without the advanced features and newer technology available in 7-plate water ionizers that cost significantly less. As far as performance, our SD501 tests went well. This machine was capable of producing multiple levels of alkaline and acidic ionized water using various source water with no problems. Getting the stronger alkaline and acidic levels required either slowing the flow rate at the faucet, adding a chemical enhancer solution that came with the unit or a combination of both. When testing the unit in hard water areas, just like with other water ionizers, we had some trouble getting the 2.5 pH acidic water even when using the chemical enhancer solution and slowing the flow rate. If you're in a hard water area with high alkaline mineral content, achieving the strongest acidic pH levels will always be a challenge. From what we've seen, higher priced water ionizers tend to have at least one or two "outstanding" features - advanced control panel that allows you to adjust the power at presets, dual filtration system, safety features like hot water detection or automated shutoff. We found none of this with the SD501. Instead we found one of the smallest filtration systems we'd seen. A small, single filter rated for effective removal of lead and chlorine. On the plus side, the filter area is easily accessible from the front of the unit so filter change and using Enagic's cleaning cartridge was pretty easy. And the company includes a re-usable cleaning cartridge and several packets of cleaning powder with the unit so users will have what they need for regular maintenance. As far as maintenance goes, if you follow the manufacturer's recommended guidelines for cleaning you'll be cleaning the unit every 4 to six weeks. That's a big jump from the recommended cleaning guidelines for other water ionizers. And the cleaning process was a bit more involved as well. Where other cleaning cartridges could be installed and left to run, cleaning the SD501 involves installing the cleaning cartridge, running for a short time, then leaving the machine to "soak" for up to several hours before flushing the system and re-installing the filter. Again, Enagic does include a cleaning cartridge and several packets of cleaning powder with the unit. And the cleaning cartridge is re-usable where other companies offer one-time use cleaning cartridges. Unfortunately the company wants you to re-use that cleaning cartridge monthly which means a lot of hands-on maintenance to ensure proper long term performance. As far as technology, the SD501 Kangen Water Machine uses flat electrodes and transformer power. While numerous sources promote this unit's ability to "run all day" without overheating, when we took a look at the specs on the company's main website we found that it was only designed to run for up to 30 minutes at a time. We attribute this to the transformer power system. Where SMPS power supplies regulate power fluctuations by switching modes, transformer systems do this by converting power fluctuations as heat which can limit the amount of time the device can be used before overheating occurs. The warranty is the industry standard 5-years covering both parts and labor - but read your manual and paperwork carefully. The warranty could be voided for several reasons - including not using the cleaning cartridge at regular intervals. We have to say that this unit does perform "as advertised" when it comes to producing alkaline and acidic ionized water. On the downside, producing the strongest levels of alkaline and acidic ionized water required using Enagic's chemical enhancer solution - which renders the water unusable for consumption. Where strong alkaline ionized water produced without any chemical enhancer can be used for cooking, making coffee, teas or marinades, this option is out with the strong alkaline water produced using your SD501 with the chemical enhancer solution. Bottom line - we found that the Enagic SD501 does just what is says it will do. Produces good quality alkaline and acidic ionized water. We just wish the price was more in line with the technology, features and performance. Unless you're just a die-hard fan of Enagic you may want to keep shopping. You could get a lot more for your money with other brands.